Credit: Centre for Research on French-Canadian Culture, University of Ottawa, Ste. Famille Cultural Centre Collection (C80), Ph83-R154F6. Print from the collection of Irène Lafontaine. 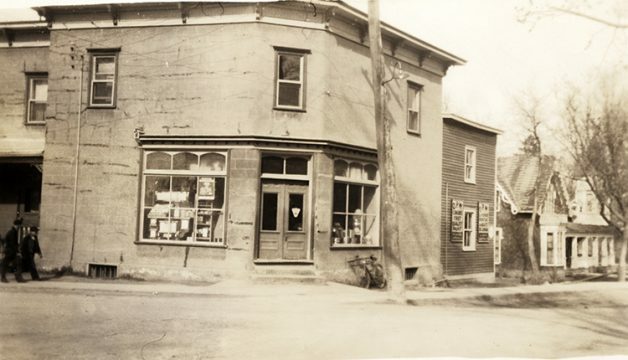 Street scene in L'Orignal, Ontario [c. 1912]. A parcel of land along the Ottawa River granted to François Prévost in 1674 was the first seigneury* in what is now Ontario. Perhaps because of its remoteness, the area was not developed for settlement until the end of the 18th century. By 1825, however, a thriving village was in evidence on the Pointe à l'Orignac seigneury. 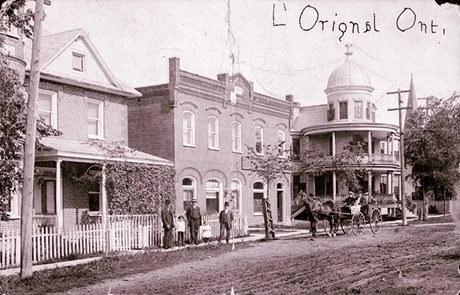 Named after the moose that were so plentiful in the area, L'Orignal was developed primarily by Nathaniel Treadwell, a land speculator from New York State who acquired the Pointe à l'Orignac seigneury in 1796. Visit the plaque – At St-Jean Baptiste School, 35 Longueuil Street, L'Orignal.